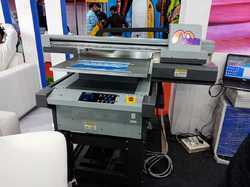 Leading Manufacturer of digital printing machine, uv digital flatbed printing machine and uv flatbed printer from Delhi. Print Material Wood, Ceramic, Metal, PVC, Corrugated Board, Plastic, Glass, Acrylic Etc. By keeping track with the technological development, we are offering optimum quality Digital Printing Machine. We provide this sublimation printer in numerous specifications. Our experts use the finest quality material and leading technology for manufacturing. We ensure our customers that this sublimation printer is quality inspected on specified parameters to meet the quality standards. Automatically measure the thickness of materials. Precision, time and Labour saving. Carriage automatically stops when colliding with obstacles. It prevents carriage and print head from damages, also protects human safety. Making the ink supply more smoothly can avoid the phenomenon of leaking ink and can save ink. The Digital Printing Machine can print on an extensive range of materials, such as Acrylics, Polycarbonates, PVC, Glass, Aluminium, Metal, Polyester, Foam board, Styrene, Wood, Stone. Attention should be paid to ink adhesion, even though it will print onto almost any substrate, levels of adhesion do differ between materials. Print Material Glass, Acrylic, Wood, Ceramic, Metal, PVC, Corrugated Board, Plastic Etc. 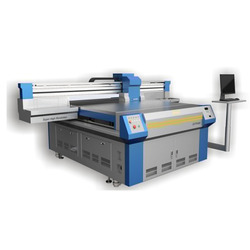 UV Digital Flatbed Printing Machine is suitable for printing all kinds of materials, rigid materials such as glass, ceramic tile, ceiling, aluminum board, wood board, door, label, acrylic, KD board, Plexiglas, foam board, corrugated paper, and so on. Flexible materials such as wallpaper, canvas, carpet, leather, paper, PVC and so on. Highest resolution is 600x2400 dpi. it is very suitable for long-time working, 24 hours running. If maintained in good condition, the life time of print head can reach about 5 years. Maximum Print Size 600 * 900 mm.